Today is the birthday of Edward W. Voigt (April 5, 1844-May 14, 1920). His father was a brewer who founded a brewery, and also trained his son, and sent him to brewing school. He worke din other breweries and in completely different businesses, but eventually worked with his father and ran the family brewery, the Voigt Brewery, in Detroit, Michigan. EDWARD W. VOIGT was an outstanding figure in connection with the development of Detroit, where for more than fifty-five years he was identified with the city’s business interests. Mr. Voigt was born in Daebeln, Saxony, Germany, April 5, 1844, a son of Carl William and Pauline (Beck) Voigt, the latter of whom died in Germany. The father married again in that country and with his wife and only son, Edward W., sailed from Hamburg for Liverpool, England, the latter part of May, 1854. At the latter port they embarked on the ship Malabar and reached New York on the 1st of August. An epidemic of cholera was then raging in New York and, moreover, the father was not in robust health as a result of conditions which he had experienced during the ocean voyage. It seemed better that they leave New York at once, which they did, and went to College Paint, Long Island. When the father had sufficiently recovered to travel they went west, stopping in Toledo, Chicago and Milwaukee, but remained in those cities only a short time, after which they journeyed an to Madison, Wisconsin. 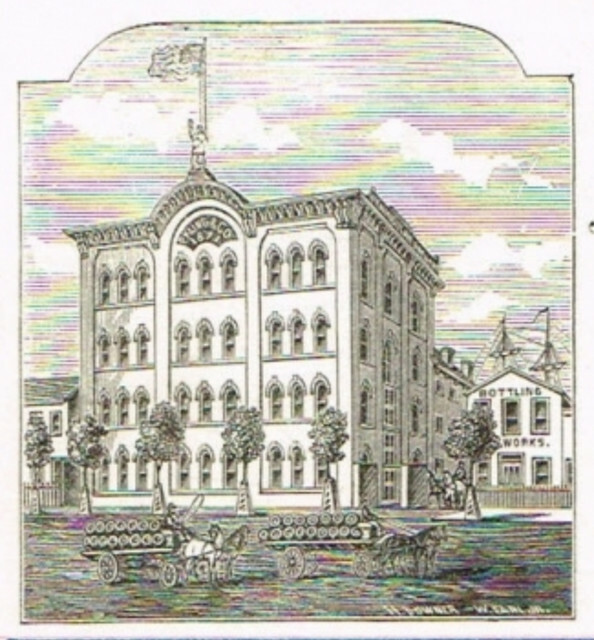 In the latter city Carl William Voigt established a small ale brewery, which was converted into a lager beer brewery in 1857, and this business he conducted until 1863, when he removed to Milwaukee, where he soon afterward purchased the schooner Columbian that plied the lakes between Chicago and Buffalo in the grain trade. In 1864 Carl William Voigt removed to Detroit, retaining his vessel interest until December, 1865, when he disposed of same. It was really his intention at this time to return to Germany, but rumors of the possibility of war between that country and France caused him to defer the trip. 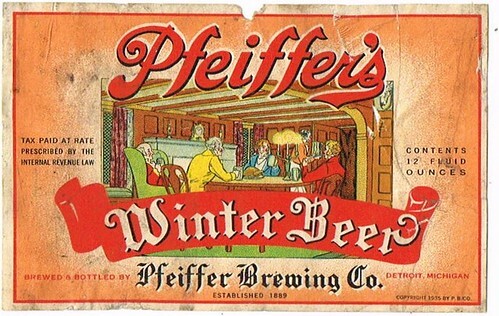 In 1866 he established a brewery in Detroit and continued to conduct this until 1871, when he leased the plant to his son, Edward W., and returned to Germany, where he engaged in the milling business until his death in that country in 1889. Edward W. Voigt was about ten years of age when his parents brought him to America. His first schooling was received in his native land and after coming to this country he attended the public schools of Madison, Wisconsin, also a business college and for one term was a student at the University of Wisconsin. He had from boyhood worked in his father’s brewery at different periods and early in life had acquired a practical knowledge of the business. In those days it was impossible to brew lager beer during the summer months owing to the lack of familiarity with the theory of refrigeration, so that during those periods of inactivity Edward W. Voigt was able to attend classes. When the weather became cooler, so that the manufacture of beer could be resumed, he again took his place as a brewer in his father’s plant. After his father disposed of the brewery at Madison in the fall of 1863, Edward W. Voigt concluded he would go to California and try his fortune in that new country. He went by the Isthmus of Panama but on reaching San Francisco found that work as a brewer was difficult to secure. He could not afford to remain idle indefinitely, so shipped before the mast on the barkentine Monitor, plying between San Francisco and north Pacific coast cities. Wages were law and the work not the most desirable. In writing home to his Vol. II-3 parents he had mentioned the character of his employment and his father replied that if Edward W. Voigt wanted to be a sailor he should come back home, as the father had bought the schooner Columbian. Edward W. Voigt returned east, again by the Isthmus route, and took the position of second mate on his father’s schooner. This was during the latter part of 1864. During the winter of 1864-65 Edward W. Voigt studied navigation in Boston, thus equipping himself to command his father’s schooner, and during the season of 1865 he was captain of the vessel, which was sold in December, 1865. 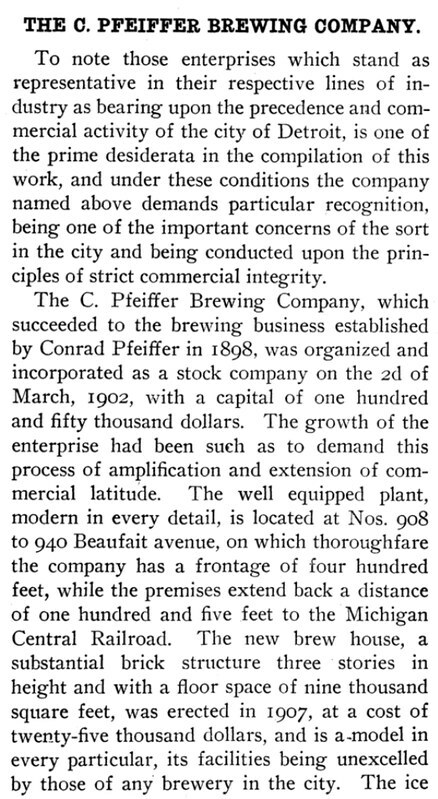 The following year Edward W. Voigt entered the employ of his father in the brewery which the latter had established in Detroit and continued in that capacity until 1871. At this time his father decided to return to Germany, so that the brewery equipment was disposed of to the son, who rented the plant for a term of four years, later renewing the lease for five more years. This was a downright business transaction and the fact that the father and only child were the principals made no difference whatever in the terms of the deal. The son had practically no capital at all and the father was secured by chattel mortgage on the stock and equipment. This was Edward W. Voigt’s beginning in business for himself and at a time when competition was keen, as there were no less than thirty plants in the ale and lager beer line in Detroit, but he was young, energetic and a hustler. Under his management the business began to grow from the very start and before long he was on the rapid road to success, so that in 1882 he purchased outright the entire interest of his father. The high class product that he turned out soon became one of the most popular in the city and the capacity of his brewery grew from three thousand barrels annually to more than forty-three thousand barrels, which was then a larger production than that of any brewery in the state. 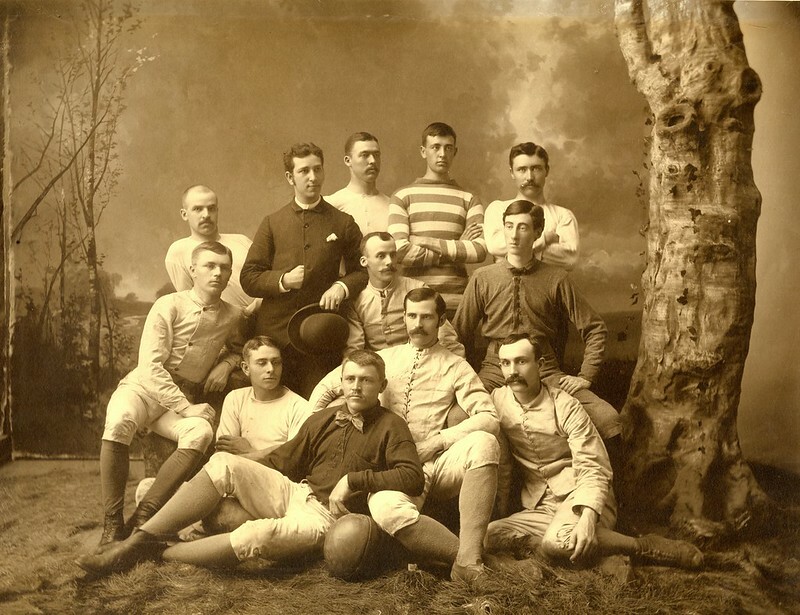 Mr. Voigt continued the business as sole owner and under his personal management until 1889, when he sold out to an English syndicate, retaining, however, a substantial interest in the new organization. 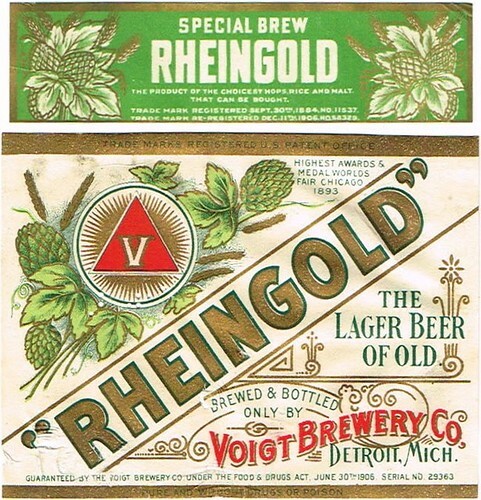 In 1895 he bought back the business and organized the Voigt Brewery Company, of which he became president, and remained as such until the business was closed out on May 1, 1918, as a result of prohibition. Subsequently the plant passed into the hands of the Voigt Beverage Company, which now owns the plant. 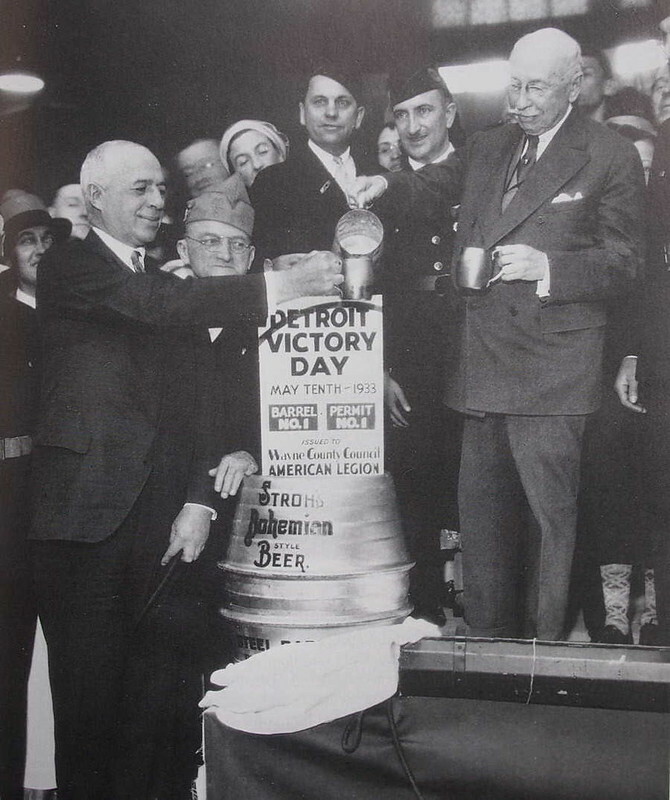 While Mr. Voigt was a most successful brewery operator and one of the most prominent men in that industry in Detroit, his activities in other lines were big and valuable factors in the city’s growth. As his business became profitable and his means began to accumulate, he invested in numerous projects that not only brought personal gain but great public benefit as well. 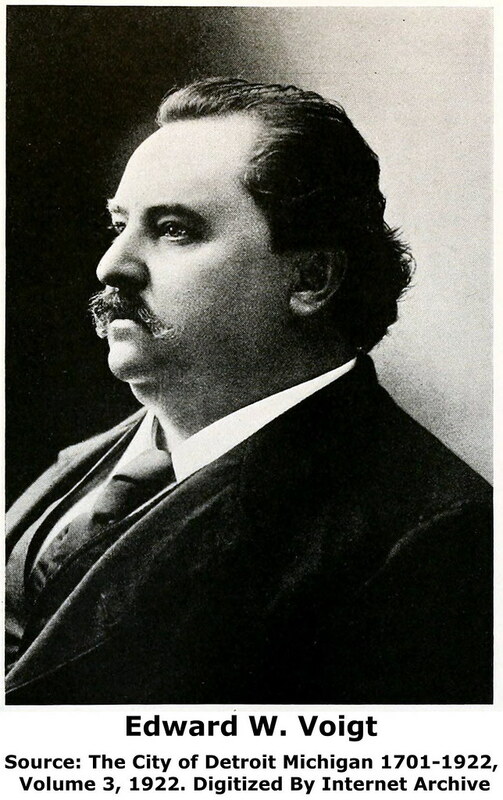 He was one of the founders of the Edison Illuminating Company of Detroit in 1886, in which undertaking he was associated with James Scripps, George Peck, Simon J. Murphy and several others. This company had a capital of one hundred and fifty thousand dollars and for fifteen years Mr. Voigt was its vice president. It proved a profitable project from its inception and led to Mr. Voigt’s further connection with various public utilities. He helped in establishing branches of the Edison Illuminating Company at Grand Rapids, Jackson, Sault Ste. Marie and Petoskey, Michigan. Mr. Voigt was formerly the owner of a tract of about one hundred and fifty acres of land on Woodward avenue four miles from the city’s center that he operated as a farm for a number of years. Then as the city began to expand he developed the property into the Voigt Park subdivision, which was laid out in the ’90s. In connection with that project he donated the present Voigt Park to the city. He laid out Boston and Chicago boulevards, as well as Atkinson, Edison, Longfellow and Calvert avenues and Glynn Court, comprising some of the best residential property in the city. Years ago Mr. Voigt purchased what was then known as Moores Bay, a tract of land of about fourteen acres at the foot of Twenty-fourth street, which was covered by six feet of water. This was filled in to the harbor line after nearly forty years of effort and was transformed into a valuable property. In 1919 the same was condemned by the city for dockage purposes. 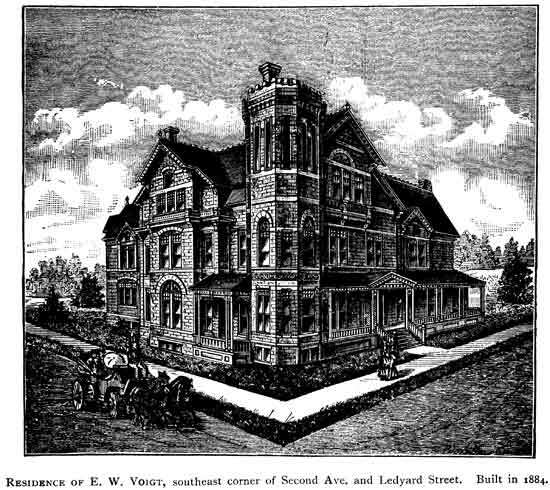 He was an extensive owner of central property and his city realty included his residence on Second boulevard and Cass Park, which was completed in 1886 and was his home until his death. This fine old mansion was built in the days when every detail of material and construction was most carefully considered and everywhere gives evidence of the thorough manner in which such work was done. 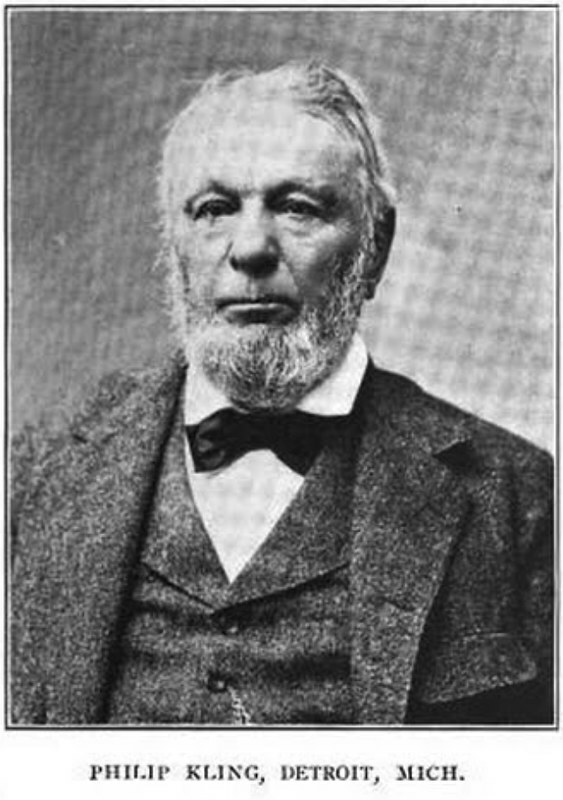 Mr. Voigt was also one of the founders of the Port Huron Sulphite & Paper Company, which was organized in 1888 and of which he was the president until his death. In 1898-1900 he built the North Western Electric Railway out Grand River road to Northville, Orchard Lake and Pontiac, which is a great feeder now to Detroit and is controlled by the Detroit United Railway. He was likewise the president of the bridge company that built the large bridge between Grosse Ile and Wyandotte in 1912. This bridge connected his large tract of valuable land with the mainland. He was also the president of the Miles Theatre Company. He readily recognized and utilized business opportunities and as the years passed by developed his interests to extensive proportions. 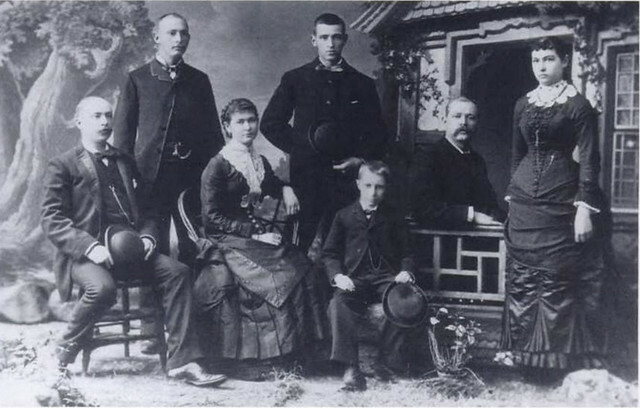 In April, 1871, Mr. Voigt was married to Miss Bertha Dramburg, of Detroit, and they became the parents of four children: Augusta L. and Pauline M., both living at home; Anna Elsa, who is now Mrs. Otto Reinvaldt, of Detroit, and has three daughters; and one son, William F., who married Miss Caroline Halloran, of Detroit, by whom he has a son, Edward W. (II), and two daughters. William F. Voigt, who is the second of the family, and Otto Reinvaldt, his son in-law, were far a number of years associated with the father in business, largely looking after the Voigt interests. Mrs. Bertha (Dramburg) Voigt died in 1890 and for his second wife Mr. Voigt married in 1892 Miss Marion Randall, of Detroit, who passed away in December, 1911. There were no children by this marriage. Years ago Henry Ford was in the employ of Mr. Voigt for a period of nine years as chief engineer of the Edison Illuminating Company. 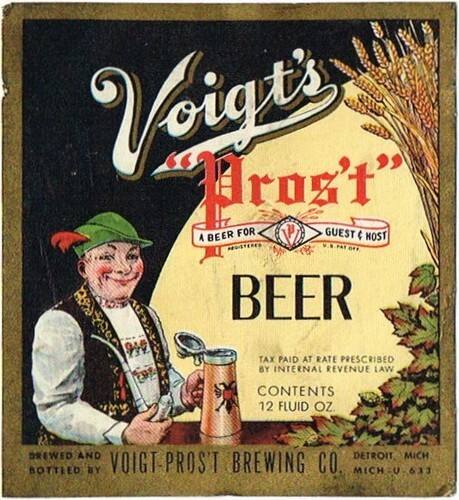 After prohibition went into effect the Voigt Brewery Company ceased to operate, but the outside interests of Mr. Voigt were extensive and important and made full claim upon his time and energy. In early manhood Mr. Voigt was a democrat, but the party’s stand upon the subject of free trade made him change his allegiance to the republican party, of which he became a warm supporter. He belonged to the Harmonie Society, to the Elks lodge and to the New Grosse Ile Golf Club. Mr. Voigt was one of the original founders of the Detroit Museum of Art. His success came from his own efforts and for many years he was included among Detroit’s strong, substantial business men. 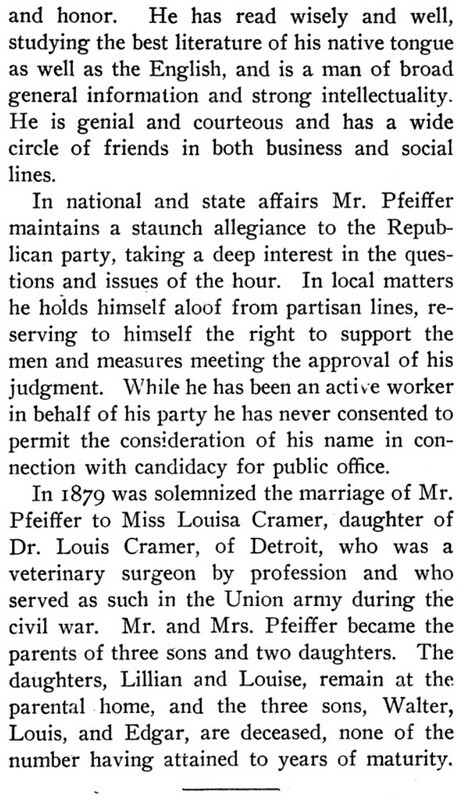 He was an unusually well preserved man for one of his years and took a keen interest in everything that pertained to the civic welfare and advancement of Detroit. 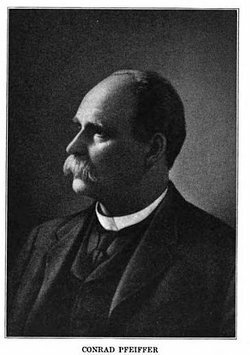 His contributions to the development of the city were of a most substantial character, making him one of the foremost business men of Michigan’s metropolis. His death occurred May 14, 1920. He was also very involved in the Grosse Ile Toll Bridge. There’s quite a bit more at Find a Grave, not for him, but for his first wife, Bertha Dramburg Voigt, who believe it or not was the family maid. 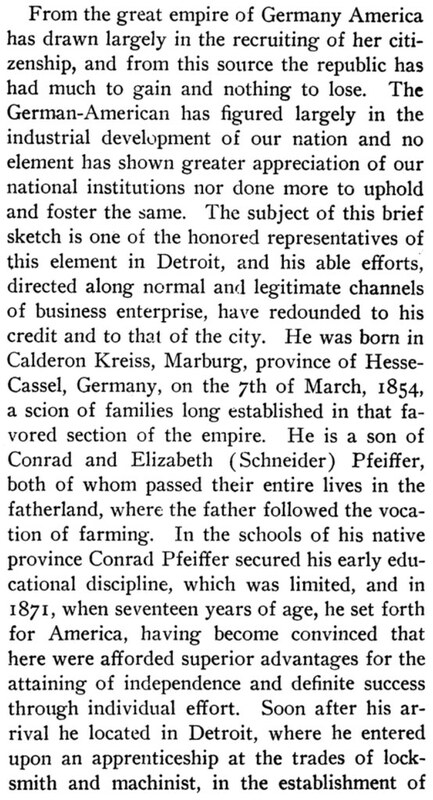 Today is the birthday of Conrad Pfeiffer (March 7, 1854-April 24, 1911). 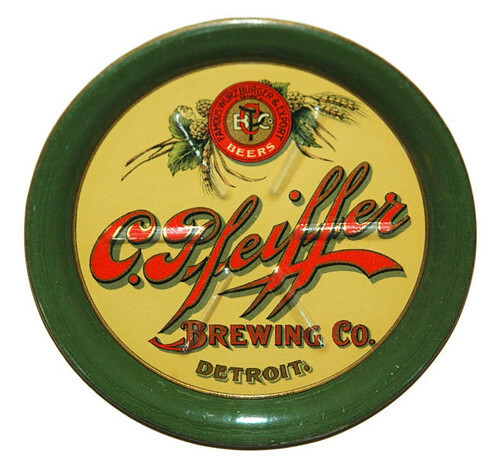 He was born in Germany, possibly Wurzburger, but moved to Detroit, Michigan in 1871, founding the Conrad Pfeiffer Brewery in 1889. 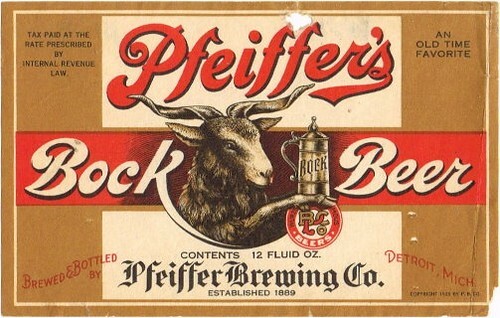 In 1902, it became known as the Pfeiffer Brewing Co. which remained its name even after prohibition. With falling sales, in 1962 they changed the name to a more generic Associated Brewing Co., but that only lasted four years with the brewery closing for good in 1966. 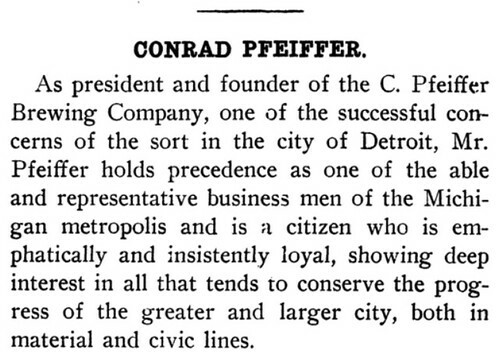 This biography of Pfeiffer is from the “History and Biography of the City of Detroit and Wayne County, Michigan,” published in 1909. 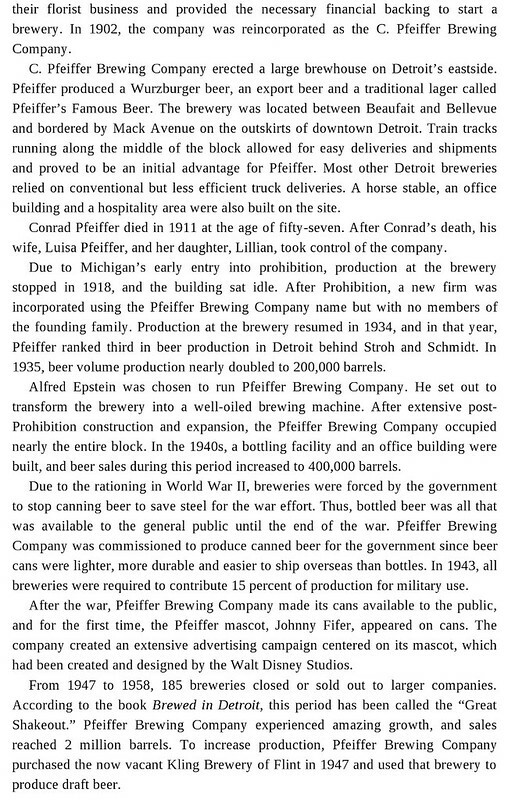 And this history of the brewery is also from the “History and Biography of the City of Detroit and Wayne County, Michigan,” published in 1909. Today is Fred Bueltmann’s 50th birthday — the Big 5-O. Fred was a partner in New Holland Brewing, and was their VP of brand and lifestyle before announcing his departure last fall. He’s also a self-styled Beervangelist and published the “Beervangelist’s Guide to the Galaxy,” which was successfully funded on Kickstarter. I’ve met Fred several times over the years but got to know him a lot better at GABF a couple of years ago, when it seemed like we judged together on every other session, and had a marvelous time in between rounds. Join me in wishing Fred a very happy birthday. Fred’s promo shot for his Beervangelist book. 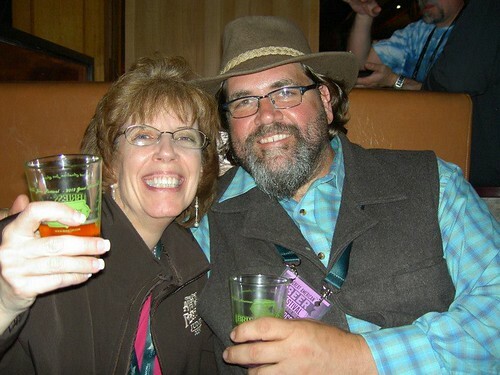 With Carolyn Smagalski at Wynkoop during GABF a couple of years ago. (“borrowed” from her Facebook page, thanks Carolyn). 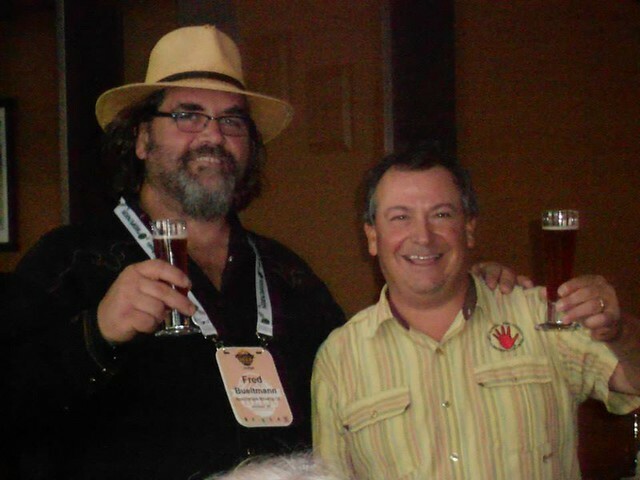 Fred, with Jeff Mendel, at GABF in 2013. 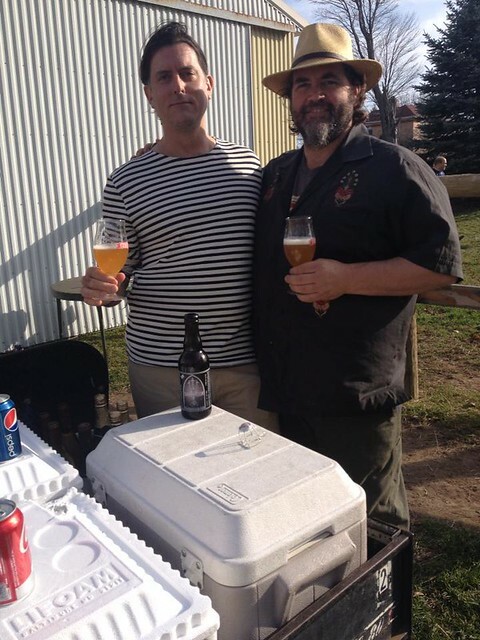 John Mallet, from Bell’s, with Fred at Red Horse Ranch in Michigan (photo purloined from Facebook). Today is the birthday of John Weidenfeller (February 11, 1867-1929). He was born in Germany, but came to America with his family, who settled in Michigan and owned a farm. Weidenfeller though, defying his father’s wishes, became a brewer, working first with “Frey Bros. and Kusterer Brewing Companies. 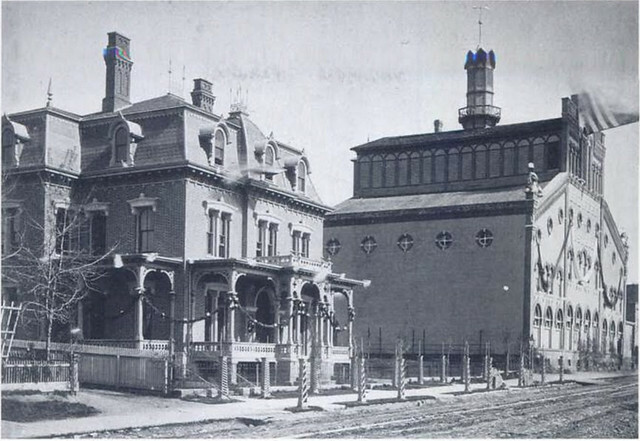 In 1892, these two breweries joined three others to form the Grand Rapids Brewing Co.” He later worked in Montana for the Centennial Brewery, before accepting a position as brewmaster of Olympia Brewing in Washington. 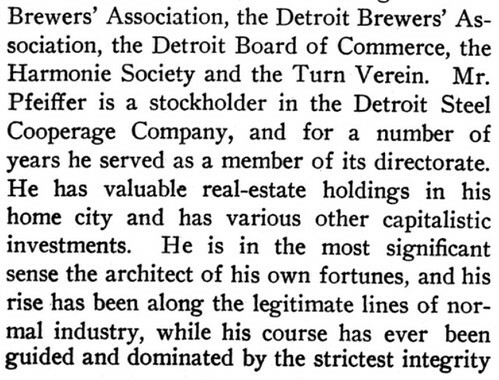 There’s less about brewmasters, as opposed to brewers who were also brewery founders or owners, when you go back this far, but there’s a pretty thorough biography of Weidenfeller by Gary Flynn at his wonderful Brewery Gems. 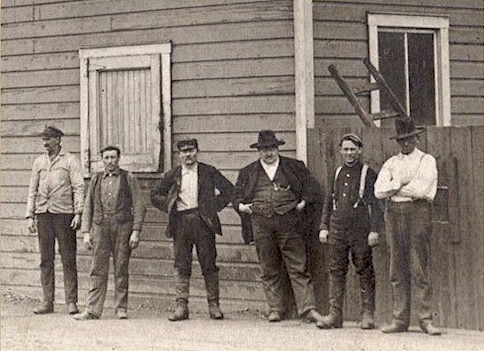 Weidenfeller around 1901, with his workers in Montana. 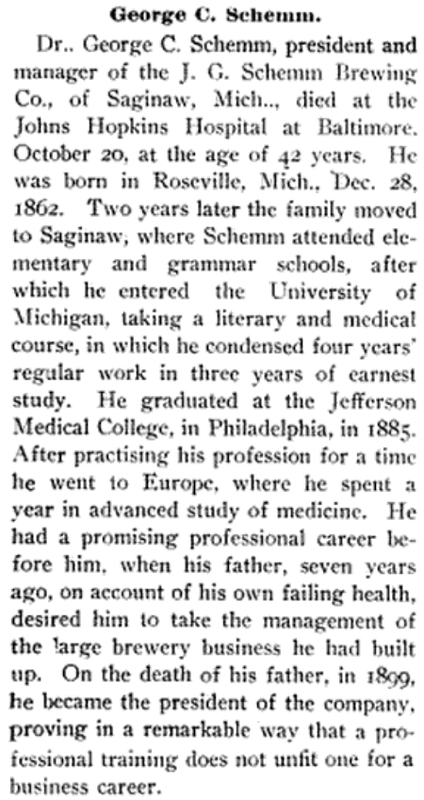 Today is the birthday of John G. Schemm (January 7, 1834-March 24, 1899). He was born in Germany, but when he was 22, in 1852, he and his father moved to the U.S., settling on a farm near Detroit. Unfortunately, after a short time, John’s Dad passed away, and he moved to Saginaw, Michigan in 1864. 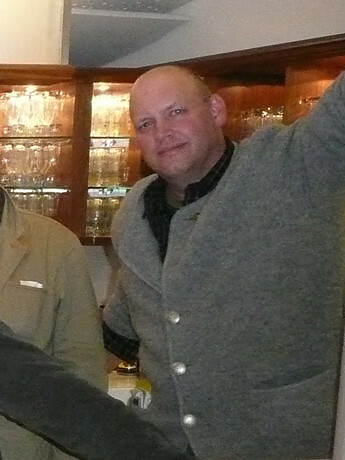 With business partner Christian Grueler, he started a brewery, the Schemm & Gruhler Brewery, in 1866. 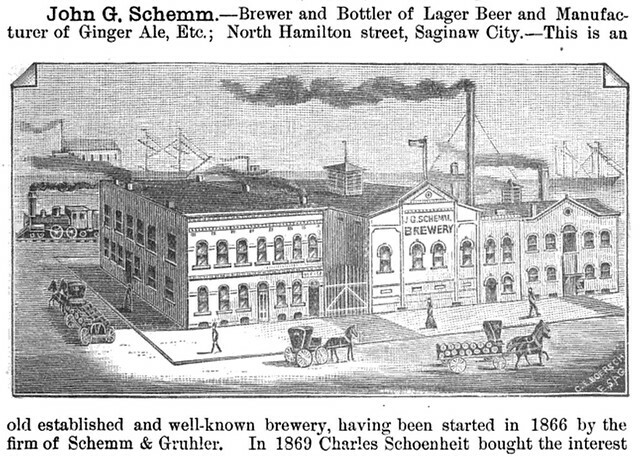 Three years later, Gruhler passed away and he brought on another partner, renaming the brewery the Schemm & Schoenheit Brewery in 1874. 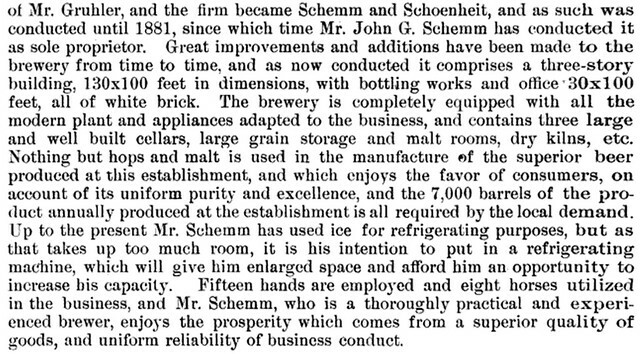 But by 1881, he bought him out, and it became the John G. Schemm Brewery. 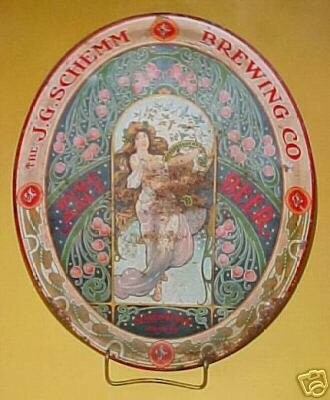 When he passed away, his son George C. Schemm took over, and incorporated it in 1899 as the J. G. Schemm Brewing Co. Inc. 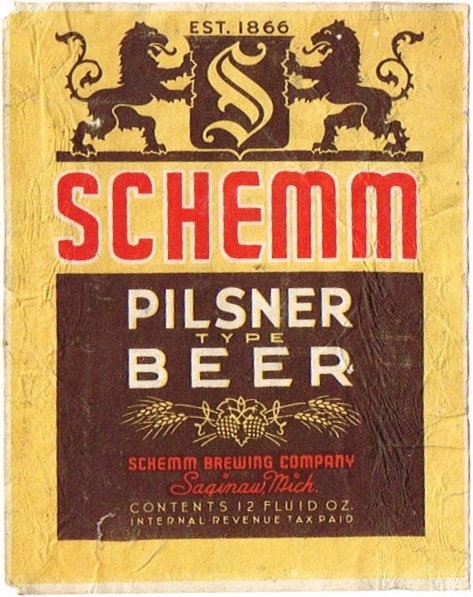 It closed in 1919 due to prohibition, and was sold to another business who tried reopening it as the Schemm Brewing Co. Inc., but it closed for good in 1938. 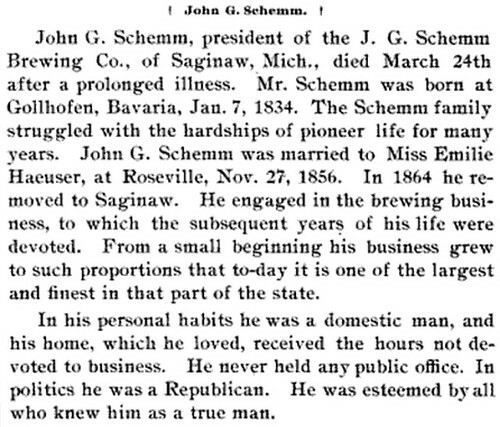 While I found some information on the brewery, there was very little about Schemm himself, not even a picture of him. 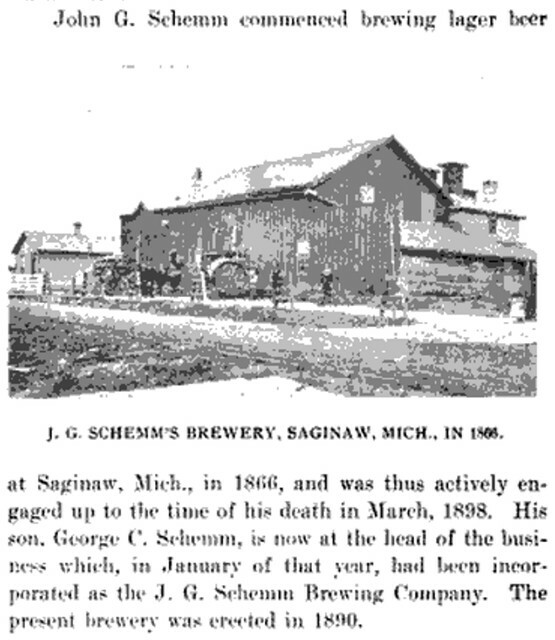 This account of the brewery is from the “Industries of the Saginaws: Historical, Descriptive and Statistical,” by John W. Leonard, published in 1887. Today is the birthday of Peter Stroh (December 18, 1927-September 17, 2002). He was the great-grandson of Bernhard Stroh, who founded Stroh’s Brewing Co. in 1850. When he became president of Stroh’s in 1968, he was the sixth family member to run the business. Peter Stroh, former chief executive of the Stroh Brewery Co., died of brain cancer on September 17th at his home in Grosse Pointe Farms, MI. Stroh was the sixth family member to head the Stroh Brewery Co., which his great-grandfather, Bernhard Stroh, founded in 1850 on Detroit’s east side. Before coming to the United States, the Strohs had been brewers in Rhineland Palatinate since 1755. Under Peter Stroh’s leadership in the 1980s, the company made a play to become a national brewer, but found itself outmatched by deep-pocketed competitors. 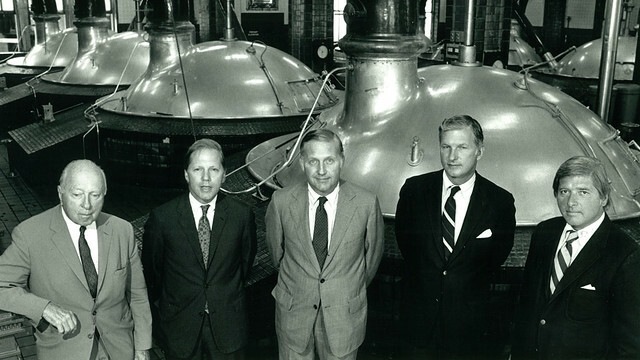 Peter Stroh stepped down as chairman in 1997, and the Stroh Brewery Co. was out of the beer business by 1999. Peter Stroh talked very little to the press, but friends said that the decline of the company’s position in the brewing industry was very painful to him. Stroh became active in the Urban League and the Detroit branch of the National Association for the Advancement of Colored People. He also worked with former Mayor Coleman Young on a variety of projects. “He and the mayor had a very strong, personal friendship,” said Bob Berg, Young’s longtime aide. The Stroh clan used personal and corporate money to develop Stroh River Place, the renovation of the old Parke-Davis pharmaceutical complex at the foot of Jos. Campau. The UAW-GM International Training Center is located on former Stroh land nearby. Stroh also was active with the Detroit Medical Center, the Detroit Symphony, the Detroit Zoo and the Detroit Institute of Arts? He served on the boards of more than half a dozen local organizations, including Detroit Renaissance, Detroit Economic GrowthCorp., and New Detroit Incorporated. Stroh also helped finance projects in genetic engineering and molecular biology, including helping a British company produce recombinant human serum albumin from brewer’s yeast. Son of Gari and Suzanne Stroh. He graduated from Princeton in 1951 with a degree in international affairs, and planned a career with the Central Intelligence Agency. But in 1952 a runaway truck in Washington, D.C., crushed him against a building and put an end to his nascent career in espionage. He was hospitalized for a year. As a college student, Stroh had worked in the brewery as a janitor. 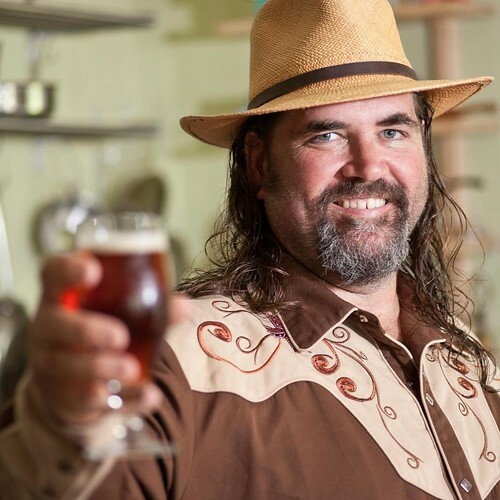 After recovering from his accident, he spent time in the brewing and laboratory departments and quickly became skilled at the technical side of brewing. He was elected to the Stroh board in 1955 and became director of operations in 1966. Named president of Stroh’s in 1968, Stroh teamed with his uncle, John Stroh, who was chairman and chief executive officer. 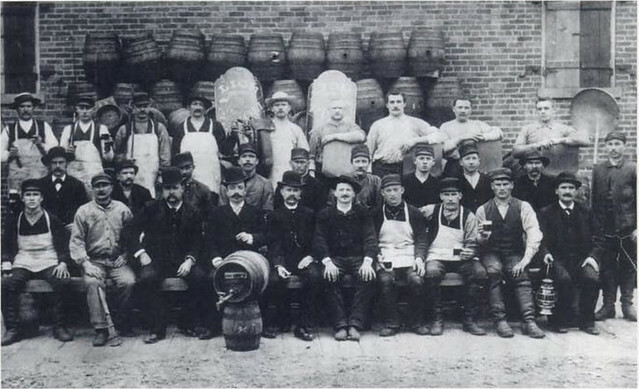 Stroh guided the family company from its regional roots to become a quasi-national brewery. Stroh’s shipped 3 million barrels in 1970 and 24 million in 1985. 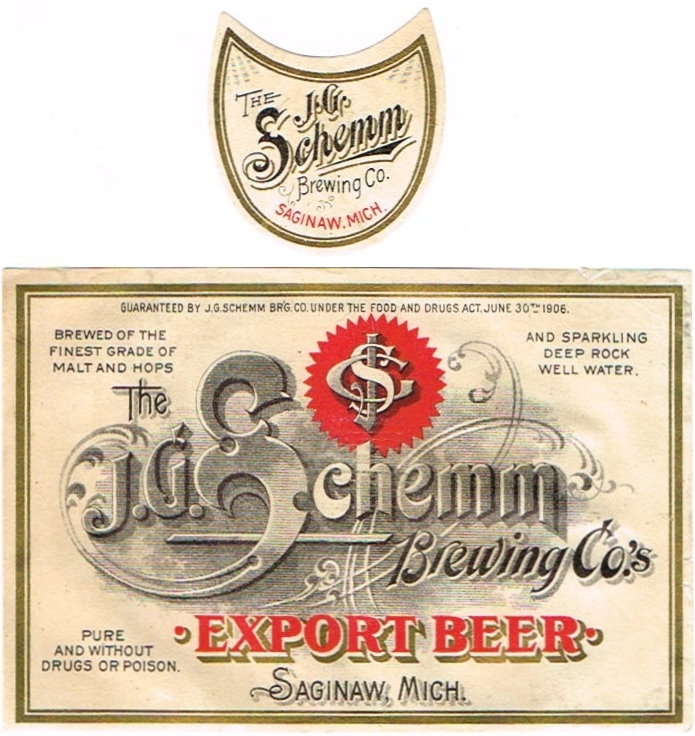 Stroh bought F. & M Schaefer in 1980, and in 1982 purchased the Jos. 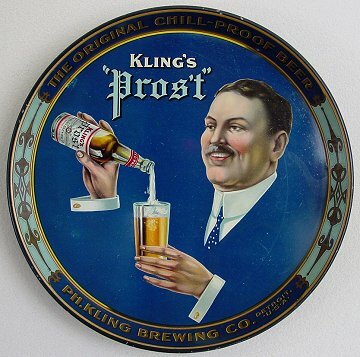 Schlitz Brewing Co. At that time, Stroh was the number three brewer behind Anheuser-Busch and Miller. But the acquisitions bred over-capacity, and Stroh chose to close its flagship brewery in downtown Detroit in 1985. “This was one of the most difficult decisions we ever made,” Stroh told the Detroit Free Press at the time. 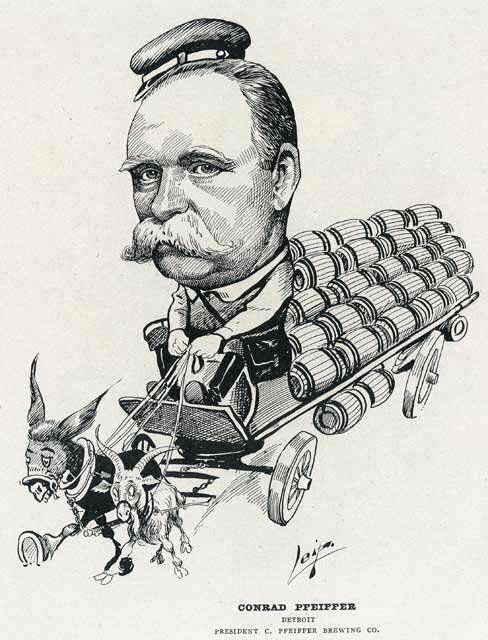 The battle for market share against the top two brewers gradually drained the company’s coffers, although Stroh tried various imaginative strategies to survive. In 1989, Stroh and Coors came close to a deal in which the Golden, CO-based Coors would purchase Stroh. Unfortunately, the deal came unwound, and Stroh was forced to go it alone. In the mid-1990s, Stroh bought the troubled G. Heileman Brewing Co. The deal brought the company a handful of strong brands, but also more capacity than it could ever use. Over the years, the Stroh brands were consistently rated tops among the major brands, but the brewery could never muster the marketing muscle to compete with A-B and Miller. In 1999, the company announced it would exit the brewing business, and it sold its breweries and brands to the Miller and Pabst Brewing Companies. Outside his work in the beer business and the city of Detroit, Stroh made his mark as an outdoorsman and conservationist. He served as a member of the National Audubon Society board, did fund-raising for Ducks Unlimited, was a trustee for Conservation International, which specializes in Latin American issues, and sat on the board of actor Robert Redford’s Institute for Resource Management, which tries to settle environmental disputes without lawyers. He traveled the world, hunting birds and fishing. Stroh is survived by his wife, Nicole; two sons, Pierre and Frederic; one grandchild, and a brother, Eric. 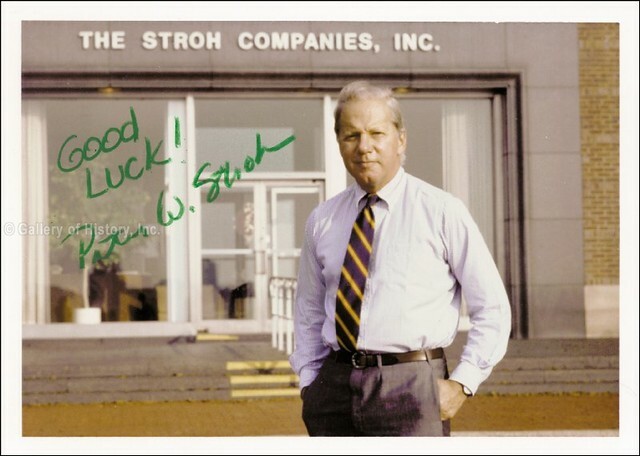 Stroh shunned the limelight, but he took seriously his commitment to the family company and his community. When Stroh became chairman and CEO of the brewery in 1968, it was still trying to recover market share lost in a 1958 strike, and it was clear national brands were squeezing out local ones. Stroh began introducing products and acquiring other brands until by 1982 it was the third-largest U.S. brewer. But with acquisitions came crippling debt. 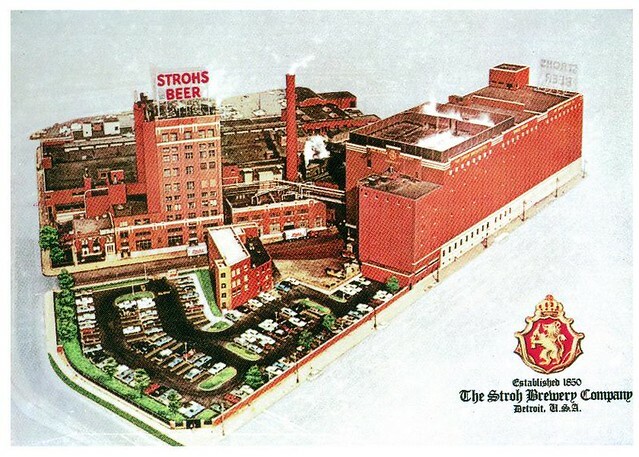 In 1985, Stroh closed the Detroit brewery on Gratiot Avenue near Eastern Market where the Brewery Park development now sits; it is the headquarters of Crain Communications Inc., parent of Crain’s Detroit Business. Stroh attempted unsuccessfully to sell the company to Coors in 1989. He stepped down in 1995, and in 1999 the Stroh brands were sold to Pabst and Miller. Despite his unsuccessful efforts to save the company, Stroh and other family members have made lasting contributions to the city of Detroit. He led a $150 million redevelopment that became Stroh River Place at the site of the former Parke-Davis pharmaceutical company. An ardent hunter, fly fisherman and conservationist, he long advocated for opening the Detroit riverfront to the public and also was a driving force behind the federal designation of the Detroit River as one of 14 American Heritage Rivers. He died in 2002 at age 74 from brain cancer. 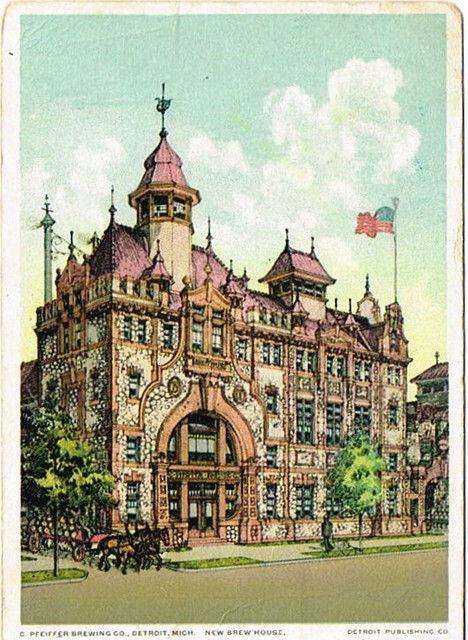 A postcard of Stroh’s Brewery in Detroit. Upon Julius Stroh’s death in 1939, his son Gari Stroh assumed the presidency. Gari’s brother John succeeded him in 1950 and became Stroh’s chairman in 1967. Gari’s son Peter, who had joined the company following his graduation from Princeton University in 1951, became president in 1968. Stroh ended a 40-year relationship with a local advertising agency for a large national agency and began targeting the larger national market. Led by creative director Murray Page, Stroh’s came up with the slogan “The One Beer…”, and by 1971, Stroh Brewery had moved from 15th to 13th place nationally. In 1972, it entered the top 10 for the first time. A year later it hit eighth place. Peter Stroh’s willingness to depart from years of tradition enabled Stroh’s to survive, but the changes were hard to swallow for many Stroh’s employees. Stroh broke the company’s tradition of family management and recruited managers from companies such as Procter & Gamble and Pepsico. He also introduced a light beer, Stroh’s Light. By 1978, Stroh’s served 17 states when it produced 6.4 million barrels of beer. By this time, the original Detroit facility was 128 years old and had a capacity of seven million barrels annually. 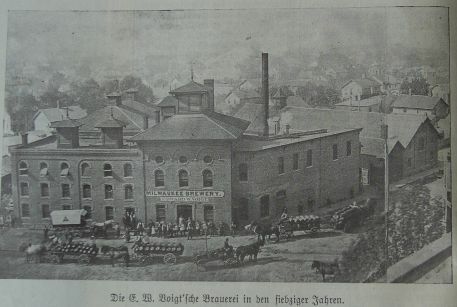 As it became difficult to make efficient shipments to new markets in the East, the company recognized that it required a new brewery. 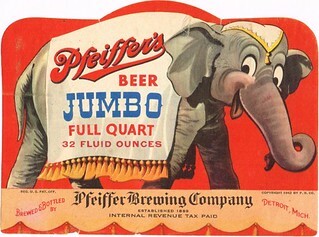 The F. & M. Schaefer Brewing Company had fallen victim to the Miller beer wars and Stroh’s purchased all of Schaefer’s stock. In 1981, the combined breweries ranked seventh in beer sales. 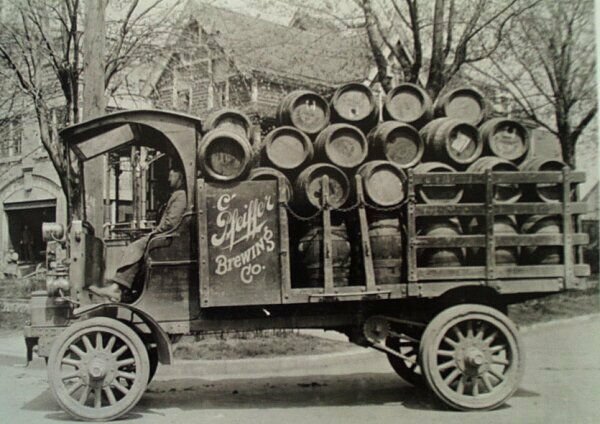 In addition, Stroh was able to take advantage of Schaefer’s distributors in the northeastern part of the country. 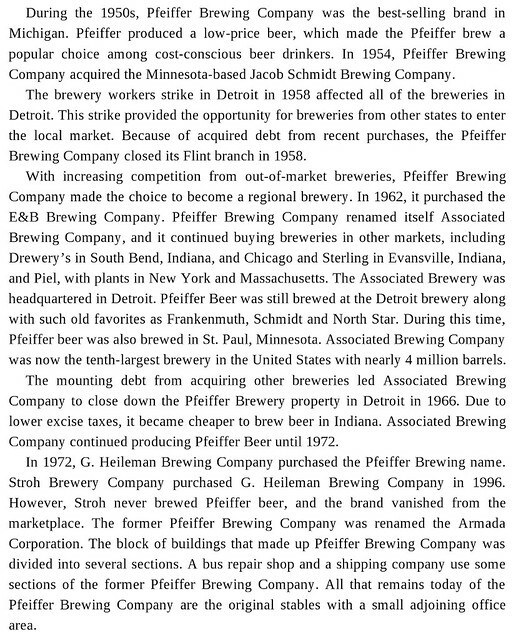 The acquisition also brought Stroh three new brands: Schaefer and Piels beers, and Schaefer’s Cream Ale. The company now had a volume of over 40,000,000 barrels (6,400,000 m3) and 400 distributors in 28 states, Washington D.C., Puerto Rico, and other Caribbean islands. Stroh’s head office used to be located at Grand Park Centre near Grand Circus Park and Woodward Avenue. In 1982, Stroh bid for 67 percent of the Schlitz Brewing Company. 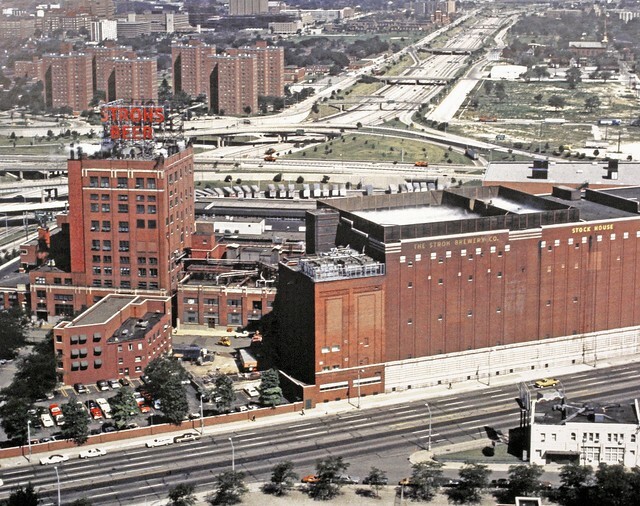 By spring of that year, Stroh had purchased the entire company, making Stroh’s the third largest brewing enterprise in America: it owned seven brewing plants and reached the market value of $700 million in 1988 (according to Forbes). During the takeover, Schlitz fought a fierce battle in the courts trying to remain independent. 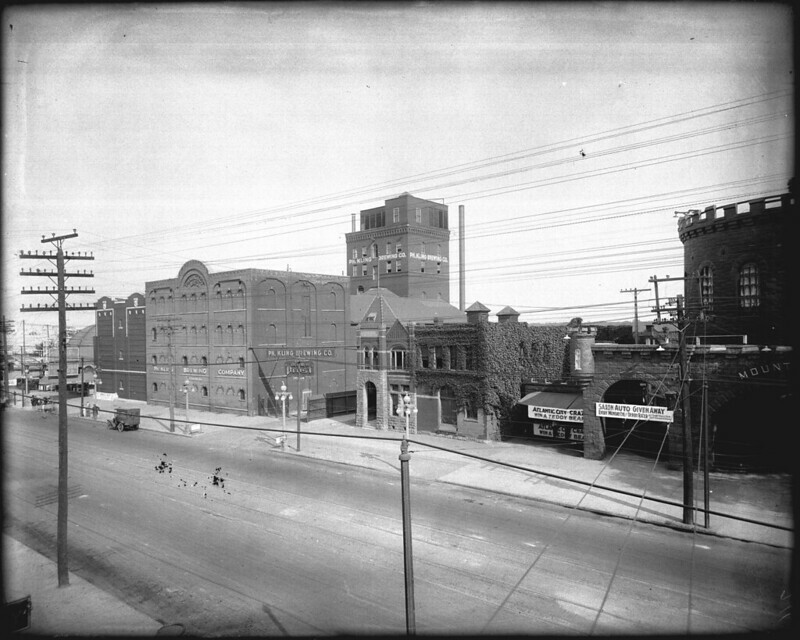 Schlitz finally accepted the takeover when Stroh raised its offer from an initial $16 per share to $17, and the U.S. Justice Department approved the acquisition once Stroh agreed to sell either Schlitz’s Memphis or Winston-Salem breweries. Forbes has an interesting article about the Stroh’s family business’ fall from grace, entitled How To Blow $9 Billion: The Fallen Stroh Family. Today is the birthday of Philip Kling (November 14, 1818-March 15, 1910). He was born in Baden-Württemberg, Germany and was trained as a cooper. He came to the U.S. when he was 17, in 1836. 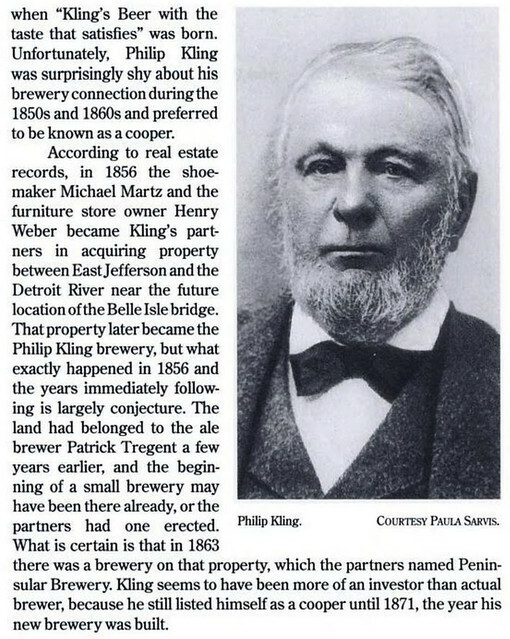 Kling later founded the Peninsular Brewery with two partners in 1856 (at least according to “100 Years of Brewing” and at least one other source. Some sources claim it was not until 1863, but I think the date from the 1903 book is more likely correct.) 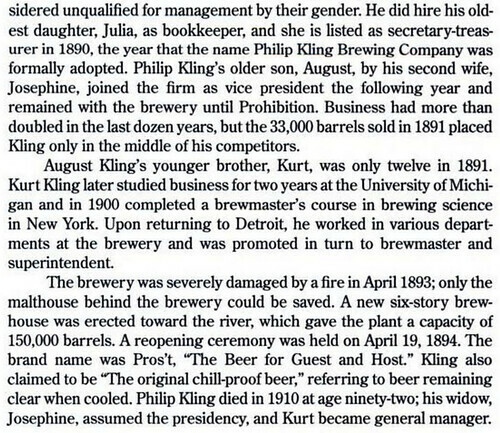 Eventually, his partners either died or retired, and in 1871 he built a new brewery, which was called the Philip Kling & Co. Brewery (and later was known as Ph. Kling Brewing Co. 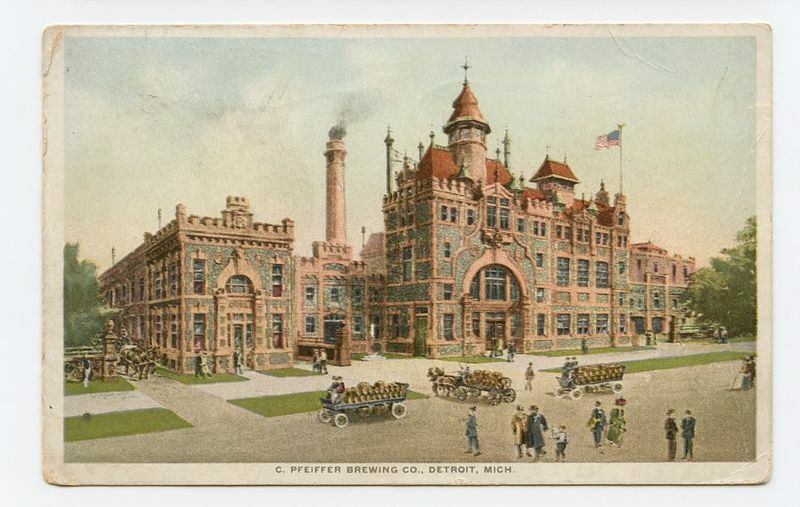 It closed for good due to Prohibition in 1919, although in 1935 his sons bought another brewery, the Dailey Brewing Co., in Flint, Michigan, and operated it until 1947 when they must have sold it, because in that year it became the Pfeiffer Brewing Co., before closing for good in 1958. 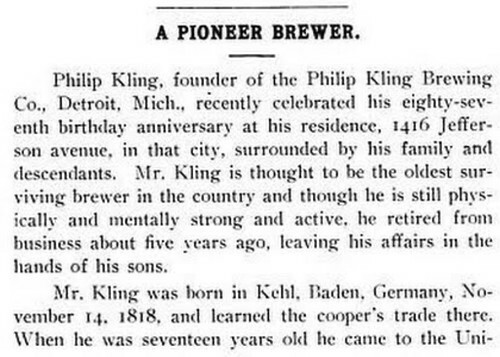 This account of Kling and his brewery is from Michigan State University Archeology Department. 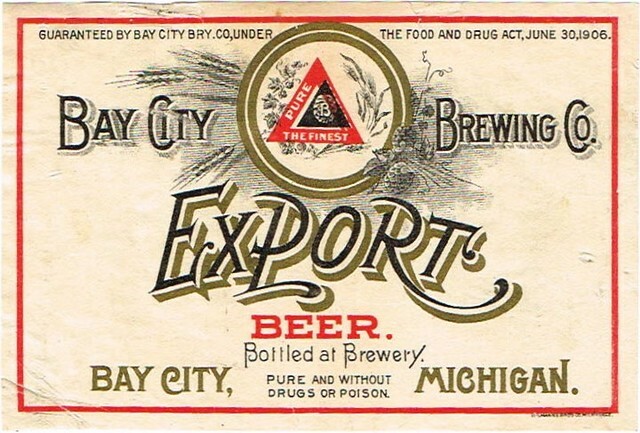 Brewing began in the city of Detroit around 1830, where the industry was run by mostly British entrepreneurs making ale. 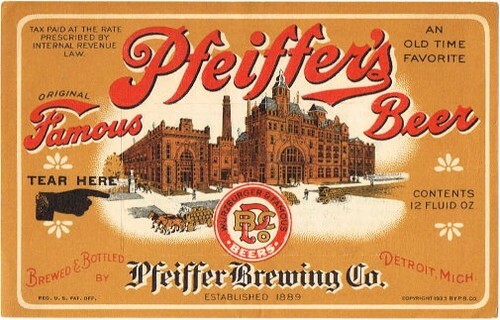 Beginning around 1848, a large influx of Germans into the area brought with it a new era of brewing in the Detroit—one dominated by German lager brewers. 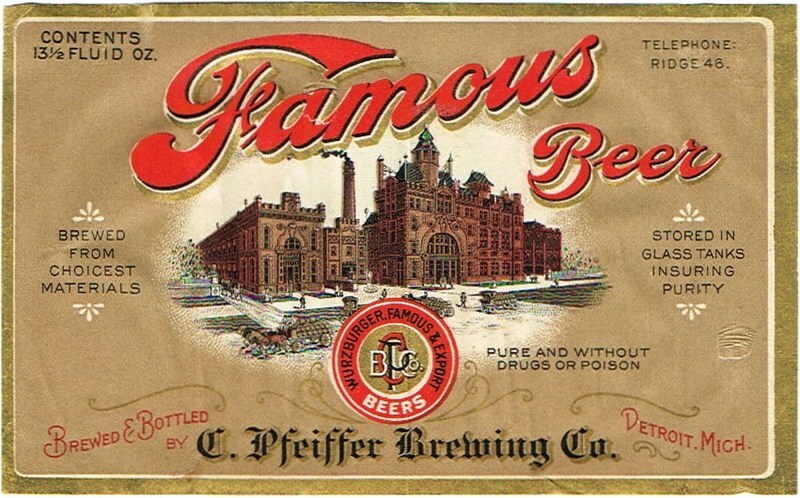 Among these German brewers was Philip Kling, a cooper, who along with Michael Martz and Henry Weber, invested in the Peninsular Brewing Company in 1856, which was located on Jefferson Avenue, near the future site of the Belle Isle bridge. 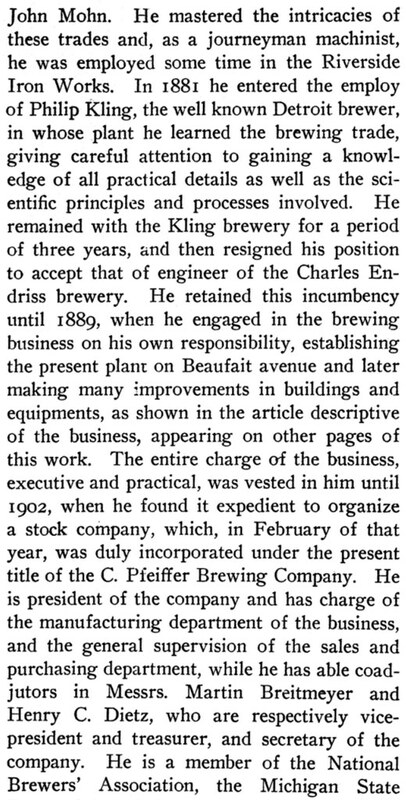 Kling gradually took greater control of the company, which was renamed Philip Kling and Company in 1868. 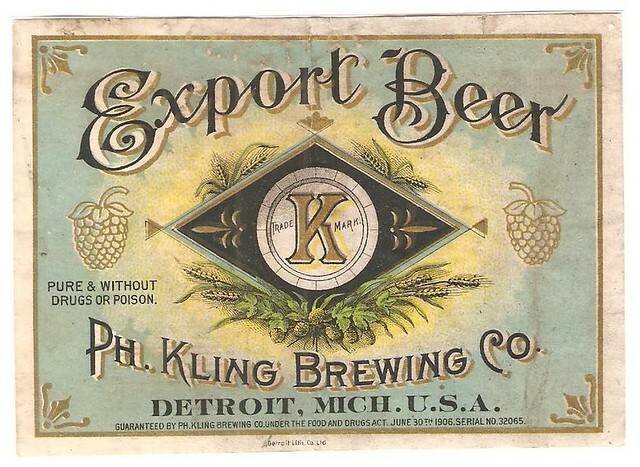 Kling became the first president of the Detroit Brewer’s Association and by the end of the 1870s, PH Kling was one of the city’s most successful and prominent breweries. Their offerings included Pilsener, Gold Seal Export, Extra Pale Ale, and Porter. 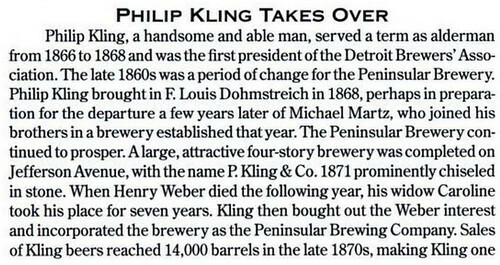 After reverting to the name Peninsular Brewing from 1879 to 1890, the name Philip Kling Brewing Company was formally adopted. 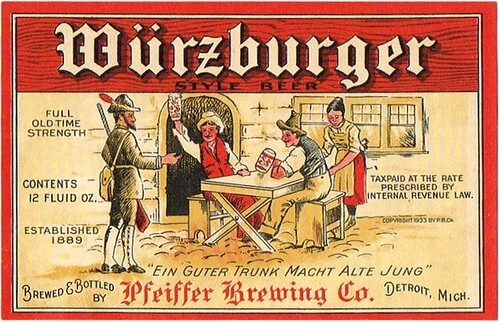 This year also marked the beginning of the great brewing dynasties, which in Detroit included the Strohs, Klings, Martzes, and Darmstaetters. However, Kling was but a middling competitor amongst the giants. 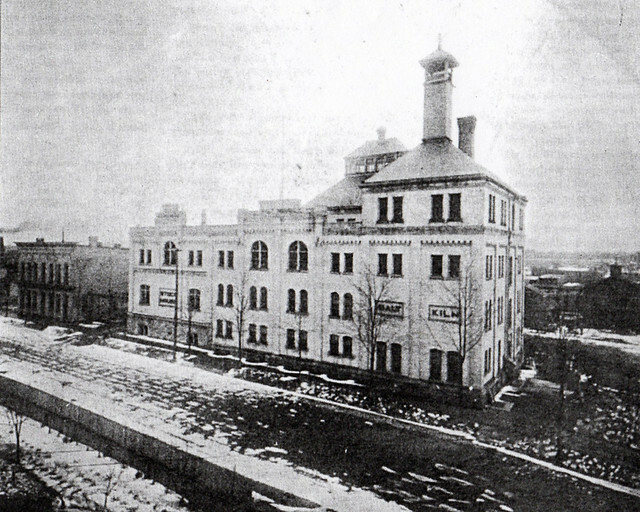 The brewery was severely damaged in a fire in 1893, and a new 6-story brewhouse with increased barrel storage was constructed. After Philip’s death in 1910, his son Kurt took over operations, but business was interrupted by Prohibition in Michigan, which began in 1917. 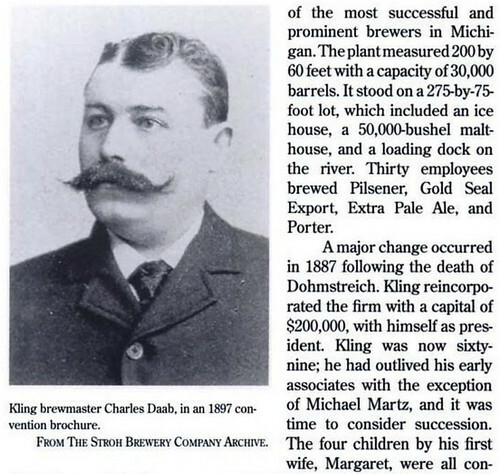 Like other breweries, the company replaced the word “brewing” in their corporate name, becoming Kling Products Company. In the attempt to keep the company running and generate income, Kurt Kling built Luna Park next to the brewery, and amusement park that included a roller coaster. However, the company was forced to close in 1921 and the building was torn down. 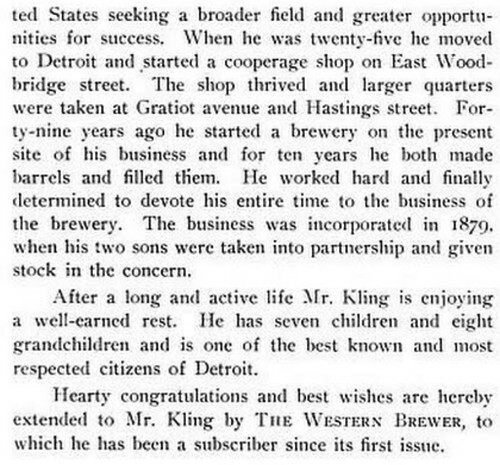 Following the end of Prohibition in 1933, Kling purchased Daily Brewery in Flint and resumed brewing by 1936. However, former bootleggers in Detroit still controlled distribution in Detroit, and Kling found it difficult to make his way back into the Detroit market. While the other major breweries were quick to make post-Prohibition recoveries, Kling’s Flint venture floundered and was out of business by 1942. Today is Pete Reid’s 55th birthday. Pete is the publisher of Modern Brewery Age. I first met Pete a number of years ago at a Craft Brewers Conference but finally got to know him much better during a trip to Bavaria a few years back, where the two of us took a side trip to Salzburg to visit the Austrian Trumer Brauerei. Join me in wishing Pete a very happy birthday. At the Zotler Brauerei in Germany. 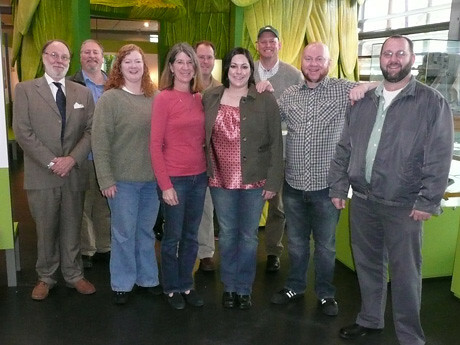 At the Bavarian Hop Museum, that’s Pete in the back row in the baseball cap. 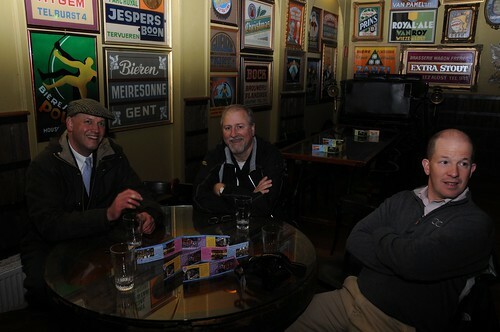 Pete, me and Chris Rice, from All About Beer magazine, during a trip to Belgium last year. 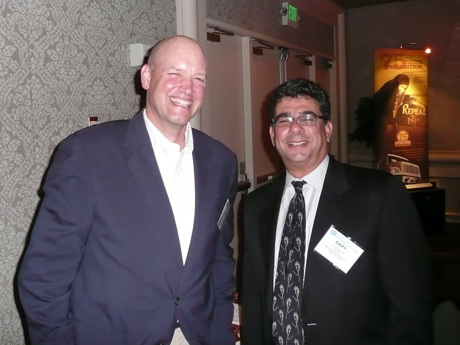 Peter Reid, with Gary Ettelman, of Ettelman & Hochheiser at the NBWA convention in 2008. 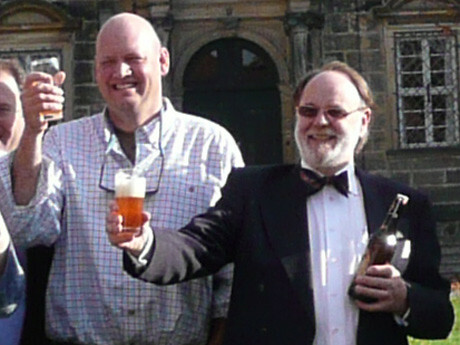 Toasting with Horst Dornbusch at the Bamberg Brewing Museum.